Want to avoid losses in stock market? Here are some important points to be remembered while investing in the market. Investing in stock market remains a good option with good profit margins. But sometimes investors fail and face heavy losses in the stock market. The stock market is risky and one has to take analytical informed decisions to generate good yields. When emotions overshadow judgment: A situation where people often fall prey to their emotions and don’t give importance to analysis cause major blunders. These emotions are prominently fear and greed that affect the decisions of the investor in a negative manner. Some decisions which are generally taken under the influence of emotions such as creating heavy positions in futures, investing largely in unknown companies etc. could be proved disastrous for the investor. Therefore, it is advised to lay emphasis to analysis and judgment rather going for emotional instincts. Narrow portfolio of the investor: When an investor invests only in a very narrow portfolio with limited options, there remains a higher chance of a huge loss. This happens in case the sector goes through a very rough patch, and investors depending solely on it also suffer a major loss. It is always advised that investors should invest systematically in broad portfolios so as to split the risk. A broad portfolio would mean investments in different business and a much lower risk. This is an effective way to optimize earnings by minimizing risk. When investors invest in stocks rather than businesses: Investing in stocks based on the price trends and not bothering about the business is a big reason for failure at the stock market. Sometimes decisions based on the price of stocks might be deceptive and can cause loss to the investor. The price of the stock may vary due to temporary fluctuations but it is very important to understand the business so as to determine market trends. Better decision-making about the trends. Helps in decreasing the risk. Thus, it is advised to invest in a business you understand than investing by looking at the prices of the stocks. When investors follow the herd mentality instead of technical research: A herd mentality is mostly unsuccessful in the share market. This is a common mistake that investors often commit. Such practices do not yield well in long-term and can often cause hefty loss. The main reason being these decisions are merely influenced by the acquaintances and are not based on solid technical research. This makes them a hit and trial process and another reason for a major loss. Experts advise investors to follow the technical research and analysis. Investors must work as per their personal risk capacities than following the herd. 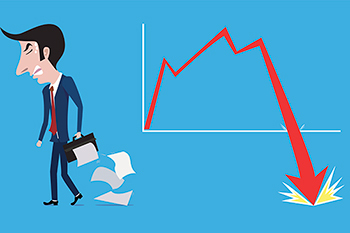 When investors don’t follow a disciplined approach while investing: Investment in stock market is a risky practice that requires utmost care in decision-making. Casual approach results in failure and hefty loss in the stock market. If an investor doesn’t work in a disciplined approach with patience and a proper strategy, it often results in failure. Investors should follow disciplined approach by properly analyzing various factors before investing. Rigorous monitoring of the trends. Constant updates on the market and economics. It is very important to note down the Don’ts so as to avoid a situation of confusion and failure. Stock market being risky in nature might not always yield good returns but can also cause hefty loss. 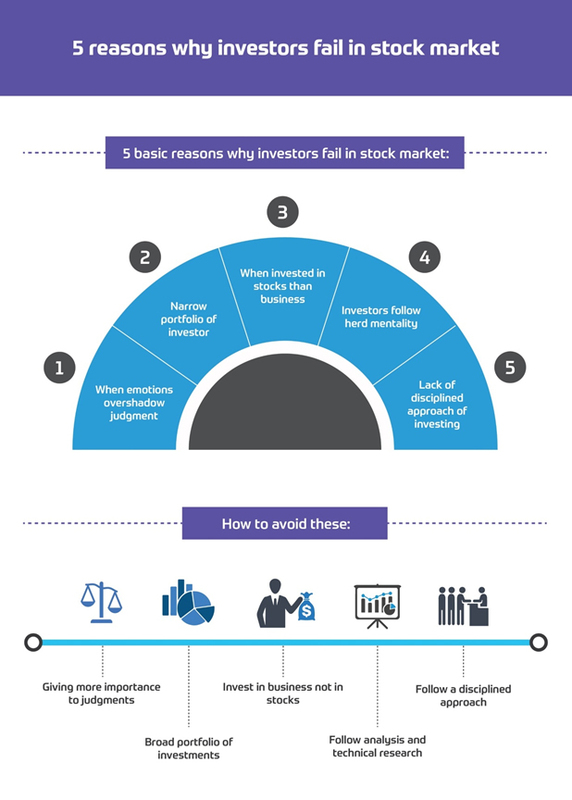 The 5 reasons for the failure of investors, in general, are noted above. It is advisable to avoid them for better returns.